Transitioning from the bedside is a huge trend in nursing care and career path. 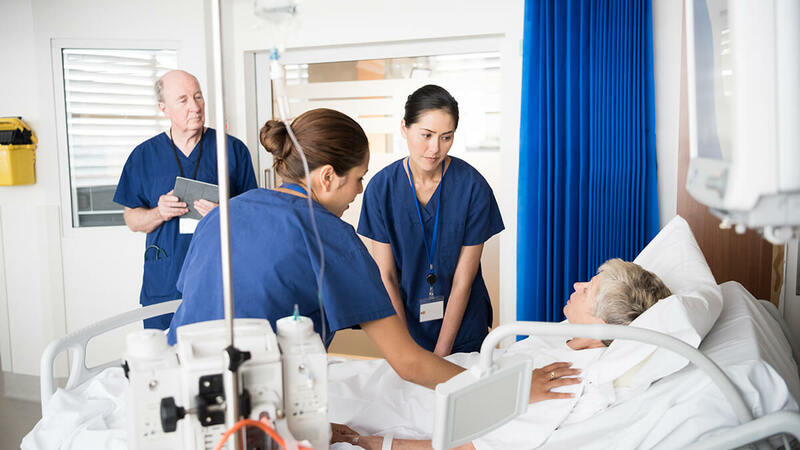 According the Bureau of Labor Statistics (BLS), healthcare and nursing will move and expand beyond the bedside and many more nurses will be needed to provide care in settings beyond the hospital. In order to contain the rapidly rising costs of healthcare, hospitals are expected to discharge patients as fast as possible. This does not mean patients are well and ready to assume their own care. Post-acute care will often be required such as long-term care facilities, skilled nursing facilities, outpatient care, clinics and home health care or hospice will be needed. As the paradigm shifts, nurses need to be prepared to meet the needs beyond bedside care in acute care facilities. Historically some of these fields have been looked down upon by nurses who were misled to believe it is not the best use of skills and abilities and can even be substandard care. When indeed for decades now, all of these areas have been expanding and providing nurses many challenges in utilizing skills and patient teaching opportunities. The focus beyond the bedside is to prepare patients to resume a lifestyle similar to their prior level of function and to be able to maintain their independence with new support systems after an episode of acute care diagnostics and treatment. Change is always a challenge and nurses who can help patients cope and make necessary changes to improve their outcomes and preserve as much independence as possible find some of the biggest rewards in the nursing profession. The population is aging, and the aging section of the population is the largest and fastest growing segment. Aging presents many challenges to lifestyle and the prevention of complications from chronic illness and pain. Mobility issues, dementia and loss of memory, wear and tear from chronic problems, poor patient education and misunderstanding of health care priorities and outcomes lead to many different needs. One of the fastest growing fields of nursing in post-acute care is home health, palliative care and hospice. Patients want to be in their own home, sleep in their own bed and eat their own food. They recover better away from exposure to nosocomial infections. They thrive in their own familiar surroundings where they find comfort and safety. Helping them to maximize their outcomes is the job of the home health or hospice nurse and the team of healthcare professionals that the nurse directs. Necessity is the mother of invention and nurses are always challenged to find a way to meet the needs of patients with diverse backgrounds and knowledge bases. Beyond the bedside, nurses have to be creative. There isn’t another nurse to grab down the hall. There isn’t just the right piece of equipment or another type of dressing material just a pneumatic tube away. In home health and hospice, the nurse has to be inventive and creative. The nurse has to work well autonomously and is often challenged by loving family members who have their own ideas about the care needed. Home health and hospice nurses have to be jacks of all trades. They have to be comfortable and confident in their assessment and procedure skills. Autonomy is essential, as is the ability to ask for help when necessary. They are the eye and ears of the physician because the patient is no longer in the hospital where the physician has eyes on them. They have to be curious and studious and know how and where to find answers. Google is their best friend. You tube videos are a godsend. Whether it’s learning a new procedure or treatment or understanding where the patient or family member got their “medical degree,” having access to the Internet is one of the most valuable tools for nurses beyond the bedside. Continuing education for all nurses is a positive necessity even if it’s not required by the state where the nurse is licensed to practice. Keeping up with changes and trends in healthcare is essential to evidence based best practice nursing and to improved quality of care and outcomes. End of life care and pain management is one such area. The evolution of assessment and treatment of pain has seen some enormous change and will continue to do so. Home health and hospice are always undergoing changes to improve care and documentation to prevent fraud and abuse. This can be overwhelming and require big learning curves. But home health and hospice care are two of the best examples of true interdisciplinary teamwork and case management in the continuum of patient care services. The interdisciplinary team consists of the nurse who is the team manager. Then there are the therapists; the physical therapist (PT), the occupational therapist (OT)and the speech and language therapist (ST). They are important members of the team who can assist and instruct the patient in home safety, home exercises, activity safety, transfers, mobility and energy conservation. The speech therapist deals primarily with stroke, brain trauma or dementia, but can also be helpful in case of dysphagia or other eating/swallowing issues. Social workers (MSWs) are available for counseling, coping, and community resource referrals. In hospice, the additional team members include the Spiritual or Bereavement Counsellor (SC) and the team physician who might also serve as the hospice agency’s medical director. Certified home health aids (CHHAs) provide personal hygiene care, assistance with all ADLs, and they follow the therapist with range of motion, exercise and energy conservation as well as safe mobility and transfers. They assist the nurse through providing medication reminders, evaluating the skin and mobility issues when bathing and grooming, and are often a huge key to understanding the psych-social issues in the home setting. CNAs are not a reimbursable discipline under home health of hospice, but are often hired by patients or family members as private caregivers in the home setting. Palliative care is another growing field of care in the home setting as well as in the hospital and skilled nursing settings, but it is often very misunderstood. Assisting patients with symptom management and lifestyle changes to accommodate their symptom management, disease progression and palliative care is an evolving specialty under the home health and hospice care umbrella. It sometimes is a gateway to hospice care, but not always. Understanding the difference is imperative to encourage patient and physician buy-in and acceptance to this approach. Nursing is constantly growing and expanding while utilizing many focuses already established beyond the bedside to meet the needs of an aging and growing patient population. Use your continuing education opportunities to explore options for your nursing career path.